Beyond chimneys, ELITE Chimney & Masonry also specializes in working on wood-burning stoves. We clean and sweep stoves, as well as install stove inserts for our customers in the Chicago, Illinois, area. Just like with a chimney, a regularly used wood-burning stove is recommended to be inspected and cleaned once a year to remove the flammable creosote that is built up in the chimney. When we clean a wood burning stove, we first complete an inspection to make sure that the chimney is properly secured to the stove, as well as the condition of all installed gaskets and seals. A full sweep is done all the way up the chimney which removes all creosote buildup. 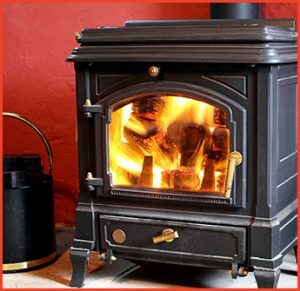 As always, we include a no mess guarantee with our wood stove cleaning service. A wood stove insert is a great addition to your existing fireplace, allowing you to cook over wood logs. This is a pre-formed wood-burning stove that fits snugly in your firebox, and uses your chimney to draft the smoke out of your home. Because it is made out of galvanized steel, it retains more heat than traditional firebrick, and radiates that heat into your home in an efficient manner.